A pressure injury is a lesion that develops on the skin and underlying tissues, usually over bony areas. It is due to unrelieved pressure in combination with shear. Pressure injuries result from lying or sitting in one position for too long a time, with or without with a shear force. The skin and tissues need enough blood supply for oxygen and nutrients. Prolonged pressure cuts off the blood supply to tissues that are compressed between a bony area and a mattress, chair, or other object. Without oxygen and nutrients, the tissue starts to become damaged and dies. Pressure—Pressure injuries can result from the inability to change position or to feel discomfort caused by pressure. People with normal mobility and sensation change position automatically, without thinking. Friction—Even friction from pulling someone across bed sheets can damage small blood vessels that supply the skin tissue. Moisture—This can come from sweating due to fever or leakage of urine or stool. Obesity —Extra weight increases pressure on the skin over the bones and joints. You will be asked about your symptoms and medical history. A physical exam will be done. Pressure injuries are staged according to the depth and tissues that are involved. Treatment aims to relieve pressure on the area, heal the wound, avoid complications, and prevent future pressure injuries. In many cases, a caregiver will provide care for your pressure injuries. Avoid placing any weight or pressure on the wound. Change position at least every 2 hours, around the clock. Make sure bedclothes are clean and without wrinkles. If needed, use a special mattress. Clean soiled skin after each bowel movement and urination. Wash with mild soap and warm water. Rinse well. Pat dry. Do not rub. Apply lotion as advised. Cleaning the sore, removing dead tissue, and applying a dressing. Not putting anything else on the sore. Washing hands before and after performing wound care. Wearing disposable gloves. Cleaning the wound every time the bandage is changed. You may need to take pain medication a 30-60 minutes before dressing changes. Eat a well-balanced meal. Your doctor may recommend vitamins, minerals, or supplements. The doctor may surgically remove dead tissue. Skin grafts may be needed. In some situations, electrotherapy may be used to stimulate blood flow and promote healing. Phototherapy using ultraviolet light may have some benefits when used in combination with other treatments. In some, it has been shown to reduce healing time. Change position in bed at least every 2 hours or, in a wheelchair, at least hourly. If you are able to move yourself, shift position every 15 minutes. Talk to your doctor about whether you should elevate the head of your bed. Find a sitting or lying position that is 30° toward one side or the other, but not squarely on the hip. Place a pillow under your calves to keep the heels off the mattress. Place a pillow between the knees. Do not use donut-ring cushions, which can cut off circulation. Use a special cushion for a wheelchair. Wear special pads to protect skin that is resting against braces and other devices. Keep the skin clean and dry. Use pH-balanced skin cleansers. Do not massage bony areas. If incontinent, use a protective cream on skin that may come in contact with urine or stool. Promptly clean any stool or urine that comes in contact with the skin. Check the skin at least daily for signs of pressure problems. Keep sheets clean and free of wrinkles. Pressure ulcer. EBSCO DynaMed Plus website. Available at: https://www.dynamed.com/topics/dmp~AN~T116231/Pressure-ulcer . Updated October 27, 2017. Accessed March 13, 2018. 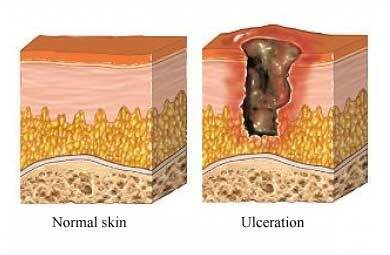 Pressure ulcer staging illustrations. National Pressure Ulcer Advisory Panel website. Available at: http://www.npuap.org/resources/educational-and-clinical-resources/pressure-injury-staging-illustrations. Accessed March 13, 2018. Taking care of pressure sores. University of Washington Medicine website. Available at: sci.washington.edu/info/pamphlets/pressure%5Fsores.asp. Updated March 13, 2018. 5/27/2011 DynaMed Plus Systematic Literature Surveillance. Available at: https://www.dynamed.com/topics/dmp~AN~T116231/Pressure-ulcer : McInnes E, Jammali-Blasi A, Bell-Syer S, Dumville J, Cullum N. Support surfaces for pressure ulcer prevention. Cochrane Database Syst Rev. 2011;(4):CD001735. 11/25/2013 DynaMed Plus Systematic Literature Surveillance. Available at: https://www.dynamed.com/topics/dmp~AN~T116231/Pressure-ulcer : Moore ZE, Webster J. Dressings and topical agents for preventing pressure ulcers. Cochrane Database Syst Rev. 2013;8:CD009362. 8/11/2014 DynaMed Plus Systematic Literature Surveillance. Available at: https://www.dynamed.com/topics/dmp~AN~T116231/Pressure-ulcer : Chen C, Hou WH, Chan ES, Yeh ML, Lo HL. Phototherapy for treating pressure ulcers. Cochrane Database Syst Rev. 2014;7:CD009224. 6/22/2015 DynaMed Plus Systematic Literature Surveillance. Available at: https://www.dynamed.com/topics/dmp~AN~T116231/Pressure-ulcer : Qaseem A, Mir TP, Starkey M, et al. Clinical Guidelines of the American College of Physicians. Risk assessment and prevention of pressure ulcers; a clinical practice guideline from the American College of Physicians. Ann Intern Med. 2015;162(5):359-369.